15-wagons long train stopped on a train station in Malbork, scrubbing around. I was waiting there impatiently with Peggy, mum, dad and sister, with all my stuff packed in four bike bags and one handlebar bag. 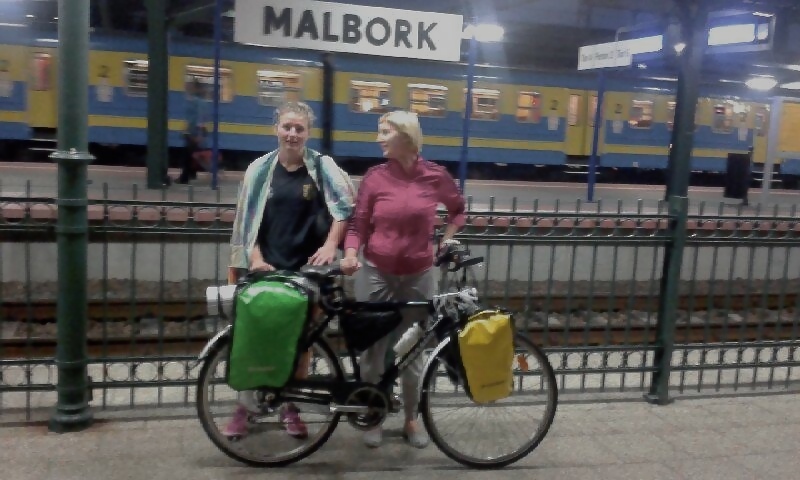 Each of us was keeping something in hand, ready to run, to pack everything quickly into the train to avoid the situation of the train leaving without me, a bag, the other bag, or – in the worst case – without a bicycle! Whew! The-wagon-number-thirteen-adapted-for-transport-of-bicycles stopped just in front of the bench, where we’ve been waiting for the last 15 minutes. I opened the door and – what did I see? I saw seven bicycles installed on the space of two square meteres; not to forget to mention three hooks on the wall. Hmm, now I got to know what exactly they meant by “limited space for bicycle transportation” in the on-line reservation. Well, what can I do? Let’s push it! And so we started with eighth bike installation. – How can I help you? – So I started explaining that the ticket and no space and the bike bags and actually I’m quite despaired and I don’t know what’s gonna happen now and what to do. – No worries – she said – I’m in exactly the same situation. Let’s lift the bike up here, bike bags over there and it will be ok. Oh, how beautiful your bike bags are! – she shouted with quite an admiration. Well, that’s actually true! My bike bags from Crosso are beautiful, especially becasue they are so colorful – green and yellow! And I still look at them with some tenderness in my eyes. – Ok, it’s gonna be alright – I thought and we started lifting Peggy up there, over her bike, which meant just under the train’s ceiling, on the peak of the bike-mountain with 5-bikes-base and 3-bikes-peak. Done! Good job! Such a relief! I got to know her name – Natalia about almost three hours later, when we were already almost reaching Warsaw and she was typing her name and surname on my smartphone to send herself a facebook friend request from my facebook account. In the meantime I was looking from time to time at her short, a bit dirty nails – the effect of two months strawberry and cauliflower picking in Norway while she was narrating the stories about how beautiful Norway was and especially the place where she was located – 10-minutes bike ride from the fjords and 20-minutes bike ride from the mountains. Well, that explained why she was having the bike with her, obviously. Nat is a sailor, loosing every year battle against the sea call in the first days of the sailing season. All those lost battles made her state really proudly that she has just finished the first full year of physiotherapy studies, after four other (uncompleted) studies she had started in the previous years, but finished on the sea instead of in the examination clasrooms. Every new story of her fired the memory sparkles in her eyes and each of my stories made her eyes wider and wider open. – You know what? I’d love to go back to writing – she said after she had told me the story of her hand written travel diary, made of several notebooks glued together full of photos, drawings, maps and other memory artefacts. – Would you imagine it was my Polish language home work? – How come? – I asked. And she told me about one month during her high school time, which she had spent in the School Under Sail. – You know, we’ve been learning navigation according to the position of the stars on the geography class, on biology we had to catch an octopus and then while cutting it we’ve been learning about its internal organs, and we’ve learnt chemistry during the bread baking. – Aha – I commented in my head while bringing back the memories of my geography class with the sadly hanging toughly wiped map of the world, biology with the Parmecium profile as every year topic and the chemistry with a professor who was lecturing more to the blackboard than to the students. – And then I decided to rewrite it all to the blog and actually to start the blog writing, becasue at one point I realized what will happen if I lose this diary, if someone will steal my bag and all my memories within! But when I rewrote everything and had it all published, I got frightened that now also the other people can read it. Which made me actually stopped writing at all. But I would really like to start writing again, a paper, hand written diary, I guess. Do you get it? Yes, I do. Because I have the same problem that writing in the virtual space is something much different than writing for myself only. But I believe that stories are to be told. 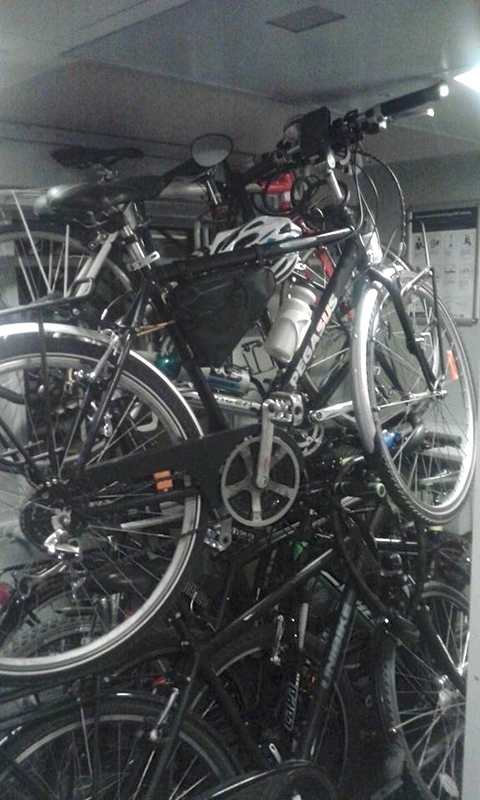 And it looks like my bike travel has already started although rather on railways than on the bike wheels. Well, the bikes were just one and half meter away from us. Thank you, Natalia, for being my first character! ❤ Good luck with writing, I will keep my fingers crossed for you!